Illegal immigration, legal immigration, controlling the Mexican border and refugees immigration that costs American Taxpayers scores of billion of dollars annually, are simply not being addressed by congress. We now have 34-million non-citizens resident in America. And we have 20 million households that speak other than English at home. The Critical Thinking Institute, which sells “Invasions” for $ 35.00 is the publisher. As a longtime customer of ours we have a special Independence Day offer for you only available from A2Z Publications until July 10, 2017. 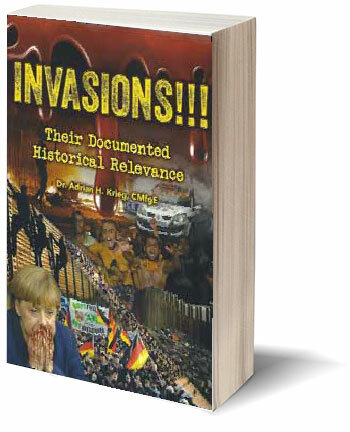 Purchase one copy of Invasions for $ 29.99 and we will ship it to you post paid no handling fee. (USA ONLY) We can do Canada for Canadian $ 35.00, Mexico for 630 Pesos. Multiple copies may later be available at special price. We are not looking to make money with this book we desire to educate Caucasians on this critical issue! This is an extraordinary book; my 23rd book that was 7 months in the making and I think, one of my best. I am confident that Invasions will like many of my books be blacklisted because it tells the truth about immigration and refugees and the consequences of open borders in America as well as in Europe. The book is already in consideration for several prizes. Buy Now Online: telephone to 1-800-431-1579, 24-7 all credit cards: Mail your cheque to us at POB 192 Parrish, FL 34219 we accept payment in Cash, company or private cheques, postal money orders, gold, silver, palladium, or platinum, we also have a good sense of humor. All books ordered from Parrish will be personally autographed.